Con artisti da Italia, Danimarca, Ghana, Senegal,Spagna che suoneranno musiche tradizionali, con contaminazioni moderne e incroci tra stili musicali di diversi Paesi, per favorire il dialogo intergenerazionale e interculturale attraverso la Musica. • hanno ripercorso le origini della propria tradizione musicale per raccogliere canzoni e musiche in via di estinzione affinché non se ne perda memoria. dal 9 al 14 Luglio. Questo concerto sarà il risultato della settimana insieme e dell’intero percorso del progetto. Il progetto, finanziato dal programma Erasmus+, coinvolge 5 paesi di due continenti diversi, Europa e Africa. Prevede l’uso dell’educazione non formale, dell’Approccio Reciproco Maieutico, musica e ICT come strumenti per lo sviluppo dei giovani e per aumentare le loro opportunità di occupazione. 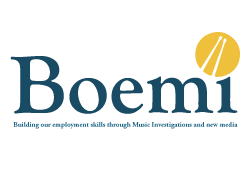 The activities of BOEMI – Building our employment skills through Music Investigations and new media are continuing! The project is addressed to youth workers and youngsters with fewer opportunities, and it aims to promote their competences and skills and to foster their active participation in local communities and in the work-lifethrough music, new media and innovative non-formal methodologies – like Danilo Dolci’s Reciprocal Maieutic Approach. BOEMI aims at increasing the expertise of 36 youth workers from Europe and Africa through the experimentation of Reciprocal Maieutic Approach in the field of music and ICT. The project wants to raise their employability skills through the involvement in a mobility experience, fostering intercultural, intergenerational and interpersonal exchanges at all levels and increasing their digital, ICT and media literacy skills. BOEMI aims particularly at growing youngsters’ self-esteem and feeling of belonging to society, increasing the confidence in their “unique selling points” and transforming their interest in music into employability skills. The project also intends to empower youth work organisations, developing new working methods, tools and materials based on non-formal education and experimenting music as an educational pedagogical tool. The kick off meeting between the various partners for the BOEMI – Building our employment skills through Music Investigations and new media project was recently held in Palermo Italy from the 26th of April to the 1ST of May 2015. CSC – Centro per lo Sviluppo Creativo Danilo Dolci is looking for 4 talented and motivated youngters, musicians or passionate with music, local traditions, non-formal education and multiculturalism to be part of the Local Working Group of the Project BOEMI – Building our employment skills through Music and Investigations new media. The project – co-funded by the European Commission within the program Erasmus +: Key Action 2, Capacity Building in the field of youth – involves young people from two continents – Europe and Africa – in order to promote their skills and to encourage the active participation in their communities through the use of music, new media and innovative and non-formal learning methods including the Reciprocal Maieutic Approach of Danilo Dolci. Take part in a big final concert in June of 2016. Do you want to be part of a project that links your passion for music and new media to the knowledge of other cultures? Do you want to live an experience that will enhance your knowledge and employability skills, allowing you to visit other countries and meet people from other continents? Centro per lo Sviluppo Creativo “Danilo Dolci” coordinates the project “BOEMI – Building Our Employment skill through Music Investigations and new media”, co-funded by the European Commission (Erasmus+ – KA2 Capacity Building for Youth in ACP countries, Latin America and Asia), aiming at increasing the expertise of 36 youth workers from Europe and Africa through the experimentation of Reciprocal Maieutic Approach (RMA) in the field of music and ICT. The project wants to raise their employability skills through the use of music and innovative educational tools, fostering intercultural, intergenerational and interpersonal exchanges at all levels and increasing their digital, ICT and media literacy skills. During its implementation, a group of youth workers will research traditional music, record and put it on the music platform. Also, participants will attend 5 workshops on music and RMA, spreading knowledge on the promotion of music through ICT. 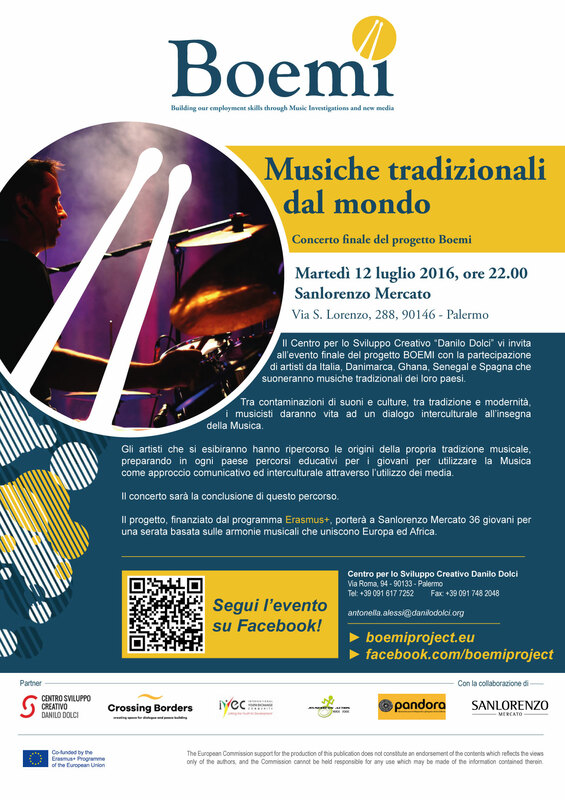 Italian participants will contribute to the organization of a final concert in Palermo involving all the BOEMI international members.